Perched between its spectacular Pacific coastline and Andes Mountains, Chile offers a wide variety of climates and landscapes ranging from the Atacama Desert, the rainiest spot on the planet with a Mediterranean landscape in the center, an Alpine district in the mid-south and fjords in the deep south. Now’s your chance to see Chile and all that it has to offer! Explore the spectacular National Park Torres del Paine, passing through the Patagonian steppe with its huge sheep farms. Journey to the amazing Atacama Salt Lake. 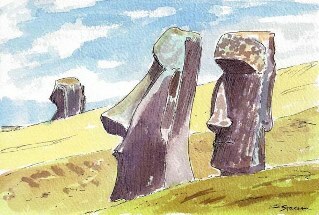 Extend your trip with a 4 day adventure to the mysterious Easter Island. Chile -Land of Contrasts is a for you travelers with true adventure at heart. Arrival at the airport of Santiago de Chile and transfer to your hotel. Check in time starts from 1400 hrs. Santiago de Chile is a city of contrasts with remains of its colonial past to the ultramodern, high-rise buildings of the financial center; Chile’s capital city will surprise you. The city tour begins with the visit of the church San Francisco, which was built between 1572 and 1618. You will pass through the Barrio Paris & Londres which is characterized by its European architectural style and its’ narrow cobbled street. Then you will pass by the sector of Club Hípico, one of the most beautiful horseracing tracks in South America, privileged by its architecture of the early centuries. Continuing your tour to the Barrio Concha y Toro where you will immediately notice that the constructions of the buildings are very similar to those in the Barrio Paris y Londres. While walking through the main street you will recover vestiges of the aristocratic past of the capital. 1989 this district was declared as “Zona Tipica”. You will be impressed by the gothic, neocolonial and Bauhaus constructions. Continue on the tour by driving up to the San Cristóbal Hill. From one of the hill’s view points, you will have the finest views of Santiago and the Andes Mountains. To round off the tour, you will pass through the modern residential areas of the city with their daring architecture and, finally, the bustling Providencia shopping zone. Transfer to the airport for the flight to Calama. Arrival and reception by our local tour guide, transfer of approx. 1 ½ hours to San Pedro de Atacama. In the afternoon half day city walk of San Pedro de Atacama, the most important Archaeological center in Chile. Situated 2,438 meters above sea level and surrounded by a green fertile oasis picturesque, San Pedro has been the center of a Paleolithic civilization with its narrow streets that have preserved of its old style dating back to the Spanish Conquerors and its beautiful colonial church that was built in 1577. The village is the center for Indian culture in the Atacama Desert. Artifacts have been recovered and are now shown nowadays in the Father Le Paige Museum, which you will visit during the walking tour. There are over 4,000 skulls; weapons and stone sand potteries that are found on display. Afterwards, you will visit the beautiful white church of the town, with an inside construction of cactus. Right in time for the beautiful sunset, you will drive to the Moon Valley in the late afternoon. It fascinates with silence, moonscape and the snow-capped volcanoes in the background. The last sunrays reaching the ground color the valley in shining orange, red and purple hues. Don’t miss this unique experience! Today you will start your tour visiting the huge Atacama Salt Lake, an inland sea dating back millions of years. Enjoy a unique experience viewing this doubtlessly driest desert in the world. The flatness, clearness and emptiness here are overwhelming. Following the road in direction to Argentina, you will get to know the Lagunas Miscanti & Meñiques, set at the base of two immense volcanoes. These alti-plane lakes are fringed with salt deposits and surrounded by brilliantly colored clumps of “paja brava”, creating a singular visual experience. Transfer from the Hotel in San Pedro to the Airport Calama (without local guide). Flight to Santiago de Chile. Arrival at the airport of Santiago de Chile and transfer to your hotel. Half-day wine tour Cavas de Maipo. In 1950, the Romagosa Machon family arrived in Chile leaving behind ancestral bonds with grape growing in Cataluña, north of Spain, a family tradition since 1714. They started to plant vineyards at the foothill of the Andes Mountains. Transfer to the airport Santiago for your flight to Punta Arenas. Upon arrival half day city tour of Punta Arenas, which is the southern most continental town of South America, founded in 1848 at the shores of the Magellan Strait. You’ll see the Independence Avenue with many monuments placed here and Cerro La Cruz vantage point offering a sweeping view of Punta Arenas’ colorful roofs, the Magellan Strait and Tierra del Fuego Island in the background. Then transfer to the local bus terminal where you will board the public bus to Puerto Natales (without local guide), the starting point for tours to the spectacular National Park Torres del Paine, passing through the wideness of the Patagonian steppe with its huge sheep farms and beech woods contrasting with the mostly unadorned landscape. Upon arrival in Puerto Natales you will be transferred from the bus station to your hotel. Today you are going to see one of the most spectacular scenic regions, nowhere found in the world, the Torres del Paine National Park! It covers an area of 113,000 hectares and has been named Biosphere Reserve by the UNESCO in 1978. Cascading waterfalls, roaring creeks, shimmering lakes and jagged spires of mountains are just a part of what Paine offers you. Transfer from the hotel to the local bus terminal where you will board the public bus to Punta Arenas(without local guide). Upon arrival you will be transferred from the bus station to your hotel. Optional: to the Penguin Colony Otway Bay (only possible from Oct 15-Mar 15) or option to the Nandu Park instead from Mar to Sep. Transfer to Punta Arenas airport. Return flight to Santiago, arrival in Santiago and transfer to your hotel. We are warmly received at the airport Mataveri and transferred to your hotel. Day island excursion with Anakena beach and picnic. 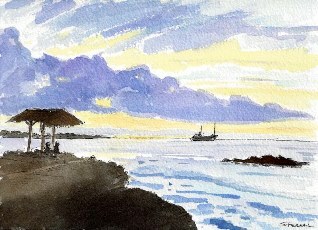 Drive to the southcoast and visit representative examples of not restored platforms, Ahus Vaihu in the bay of Hanga Te’e, and Akahanga, where supposedly the famous king Hotu Matua was buried. Proceed to Rano Raraku, quarry of almost 900 stone statues, 397 of them still lying or standing at the slopes of the extinct volcano with crater lake. Morning drive up the extinct volcano Rano Kau, appreciate on the way a view over the whole island and see its distinct geological features, proceed to an outlook at the crater lake. Afterwards drive to the ceremonial village of Orongo, where the birdman competition took place and you can see the spectacular petroglyphs related to this culture, enjoy the breathtaking view towards the 3 islets Motu Nui, Motu Iti and Motu Kao Kao opposite the coast. Drive down again to Ahu Vinapu (not restored) and for some still proof of the influence of pre-inca arquitects in Easter Island culture. Last stop is Ana Kai Tangata cave with paintings. Back to hotel. 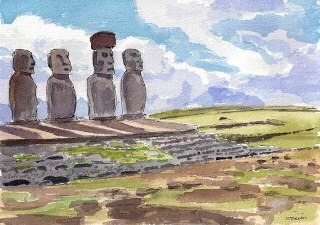 Afternoon drive to restored Ahu Akivi with 7 Moais, built in the middle of the island. The legend tells us that these statues are representing the 7 explorers who were sent to Rapa Nui by the king Hotu Matua.